If the interior of the craft was a surprise to the Wabbit, he didn't let it show, certainly not to the looming creature to whom he stretched a paw. "Commander Wabbit," he said. "Grand Mandarin of the Orange Guild." He gestured to Lapinette, then smiled broadly at the creature. "And this is my Darling, Clementine." Lapinette grinned a sickly grin but the creature said not a word. Ghost Bunny fluttered through the stream of phrases behind the curtain. "I am Commissioner Ghost Bunny of Pluto," she shrieked. The creature slid back. "Where are your papers?" yelled Ghost Bunny. The creature slid back further. "Oh don't mind her, she's doing her ghostly job," said the Wabbit in a reassuring tone. "All the same, we shall need your proof of payment for the cargo you shipped on board." The creature looked blank. 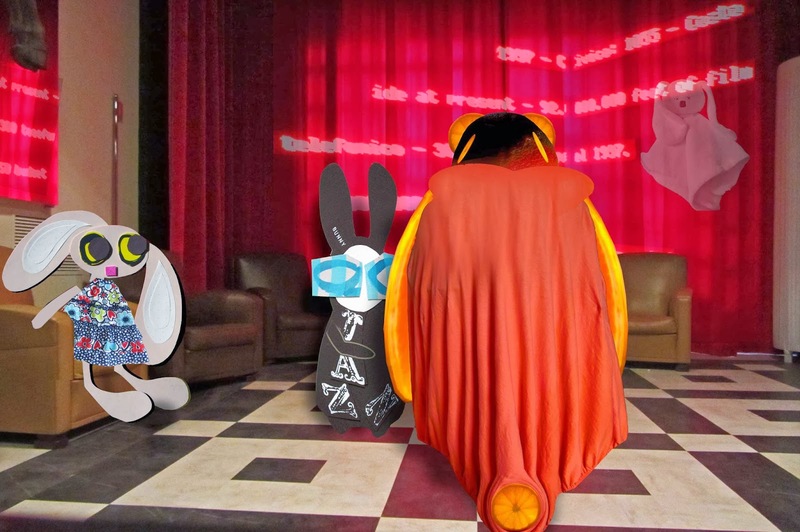 "And recquisition and purchase orders, receipts and the waybill," added the Wabbit. He glanced across at Lapinette, who smiled sweetly and spoke softly. "We further require a list of all crew and their credentials and transit papers, duly stamped." Ghost Bunny shrieked without warning. "All galactic movements including destinations and flight plans must receive prior approval of the Galactic Space Safety Board! Where are your papers?" The Wabbit noted the creature's shake of the head and he shook his own sadly. "Then you must consider yourself under arrest."